Packing for a trip with a baby or toddler can be daunting. There is so much to bring…bottles or sippy cups, baby shampoo, bibs, an inflatable baby bath, diapers and wipes, and, of course, the favorite stuffed toy. Rather than wracking your brain trying to remember every little thing you must bring along for your wee one, let us do the work for you. View and print our Packing List for Babies and Toddlers now! To make your life easier, the Packing List for Babies and Toddlers is organized by category: Clothing/Accessories, Feeding, Toiletries/Bath, Entertainment, Technology, Diapering, Baby Gear, Bedding and Miscellaneous. We’ve included extra lines so you can easily add to the list additional items that you want to remember to pack. There are columns for every member of the family, for up to five people. Have a large family? Just print out another list! Be sure to check out our Airplane Kit for Babies and Toddlers, too. It’s got all sorts of goodies to help keep your child content while in the air. The list works for road trips as well! If you’ve got older kids, check out the Travel Mamas Packing List for School Age Kids. Don’t stop with our Packing Lists! 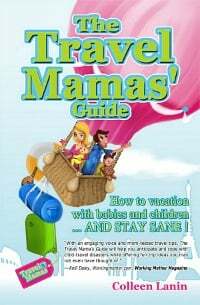 If you’re traveling with a baby, toddler, or preschooler, you will love The Travel Mamas’ Guide. This award-winning book is designed to help parents travel with children…and stay sane! Recommended by Working Mother Magazine, the Orlando Sentinel, the Calgary Herald, Babble and many others, the guide shares travel tips and humorous tales from moms and dads, travel aficionados, and childcare experts. It covers everything from airplane travel with a young child, to road trips, to visiting friends and family, to what to feed picky eaters while away from home.